Our adoption journey started in 2002. My first born son was just 2 years old. We were at an Easter party when a friend stopped by with her brand new daughter from China. She did not get out of the car because her new little one was screaming. I peeked into the back seat of the car and saw the cutest, saddest, maddest, sweetest little China doll. It was from that moment that I knew I had to have a daughter from China. Several years later the same friend was in the process of adopting her second little one from China. She was looking at the agency’s SN list and saw a little one with Hep B. She works for a GI doc who happens to be Chinese, so she asked him to take a look at a SN little girl with Hep B. His response was, “looks good, but what is the special need?” Her Doctor/boss did not view Hep B as a SN and told her to “go for it” as Hep B was most often very manageable. That little story got tucked away deep in my memory bank. Fast forward a couple of years to December 2003 when my second son was born. We now enjoyed two wonderful boys yet we still wanted a daughter. Because of the overwhelming number of boys in my husband’s family, he figured a girl wasn’t in the cards. I brought up adoption often, but he just felt done. We had our two great kids and he did not want to be out numbered. There were a many nights I went to bed sad. 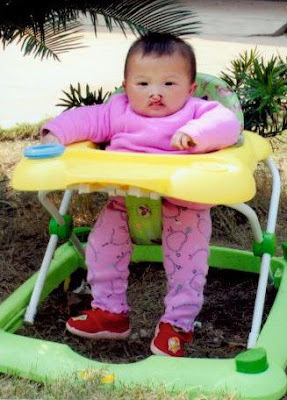 I so desperately wanted my daughter from China but knew that we both had to want her. I finally dropped it… I was not going to talk about China anymore. Out of no where, in December 2006 I was sitting on the couch, Pete on the floor when he looked up at me and said “ I want a daughter- let’s adopt”. We selected our agency (the same agency that brought my inspiration home to be with her momma) and got going on the mountains of paperwork. We had a LID of June 4, 2007 for a NSN child. After waiting almost a year and figuring we would be waiting at least another 5, we decided to switch to SN. Our son has Noonan syndrome so we knew we could handle some special needs, as he is a joy and a blessing. His milestones brought so much joy to us. When it came time for us to fill out our SN checklist, Hep B seemed like an obvious choice. Several others however, were much more difficult. We started looking at the SN list and I became a bit obsessed. The looking, losing, locking and sometimes dismissing of files was absolutely draining. We found the selection process completely unnatural and when we did not agree on the child for one reason or another, had to keep in mind that we must both agree 100% before saying yes. Information from China is often incomplete or inaccurate so we sought out help from several universities on the medical information. We each had our hearts broken and sometimes questioned ourselves for having the ability to ever say no to a child in need, no matter how severely it may impact our family. This part of the journey I would not wish upon my worst enemy. It was very hard and painful. August 13, 2008 I had a dream that I woke up looked out our bedroom window and saw a beautiful blue sky with a Cherry blossom tree blooming . . . That very morning we got “the call” at 7:15. Myriam told us we had an 11 month old baby girl with a cleft lip and palate with Hep B. I immediately fell in love and the excitement was indescribable. Pete was a little hesitant but gave the go-ahead. He was a little weirded out by her lip in the photo even though he knew this was “supposed” to be manageable. We received an update from Ladybugsnlove.com in September. Our daughter was in foster care and her lip had been repaired. What a surprise. We later found out that Love without Boundaries did the repair. We are so grateful. I traveled to China with my dad and sister and an amazing group of people. My husband wanted to stay with our boys because he felt uncomfortable leaving them for so long. What a wonderful journey it was. I loved our trip and the country. I brought home the best souvenir a family could have asked for… little Mei Mei (Naomi). Our daughter has been home with us for a couple of months. We have seen the gastroenterologist/hepatologist for her Hep B. We will go back in 6 months so they can check her levels again. So far the doctor thinks she is a classic case and probably won’t need any treatment for a very very long time. We had an appointment with the cleft team they say her lip looks good and she does not have a cleft palate. Good news!!! She will need her gum line repaired as well as a nose and lip revision when she is around 5 or 6. Our daughter is an absolute joy. Her brothers adore her as she does them. Last night as my husband laid Naomi in her bed he told her he loved her and she made his dreams of having a daughter come true. Sometimes my husband and I just look at her and know she is clearly our little girl. She makes everyone laugh. I am constantly amazed by her, she is beautiful inside and out. God truly gave us the perfect little girl. I am in Love all over again. I can’t explain how much this little girl has brought to our family, so much love and joy and a little chaos too. And it has been so fun to have a little pink in our house. I would do this all over again in a heart beat. Our blog is Finally a Family of Five, please stop by.